If you really need to type on your smartwatch (you don't) there's finally a solution (that you should avoid needing). 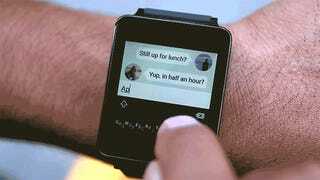 Minuum, the premier super tiny keyboard, is coming to Android Wear and from the demo reel, it doesn't look half bad. Minuum's style of hyper-predictive, low-profile keyboard was basically screaming for smartwatch integration, so this should come as no surprise. The app isn't available for the general public yet, but there's currently a beta you can sign up for. But don't. Typing on a smartwatch is very stupid and you should avoid encouraging anyone to do it at all costs. Devs, I get the appeal of trying to create a smartwatch keyboard; it's an interesting and unique challenge that no one has conquered yet! And no one should ever conquer it, because it's exactly this sort of madness that threatens smartwatch's (admittedly thin) credibility. Watches are output devices, not input devices. And while the ability to hit a big, round button that says "Send" or "Open on Phone" is a must, loading up a screen with the equivalent of some three dozen buttons is absurd. Tapping at your wrist more than three, maybe four times in a row not only makes you look like a doofus, but takes the real and awesome potential of a smartwatch and buries it in complete and total absurdity of a scientific calculator watch.